Aramith Glow-in-the-Dark Pool Kit. 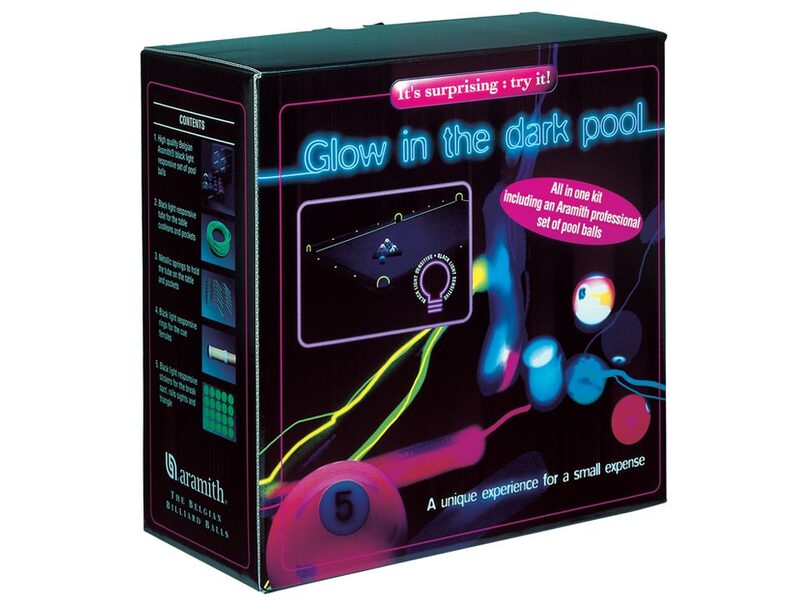 Whether you want to attract new customers to your pool room or simply want to have some real fun at home, then the Aramith glow-in-the-dark pool balls and pool table conversion kits are what you need. Installable in just a couple of steps, these glowing kits will retrofit any type or any size of table in a blacklight-responsive table that will add magic to your game. Each kit includes everything you need: a complete Aramith glow-in-the-dark phenolic ball set, reflective cushion tube with metallic springs, glowing cue rings, glowing break spots, and glow-in-the-dark rail sights. Note that you do need a blacklight to get the full effect.